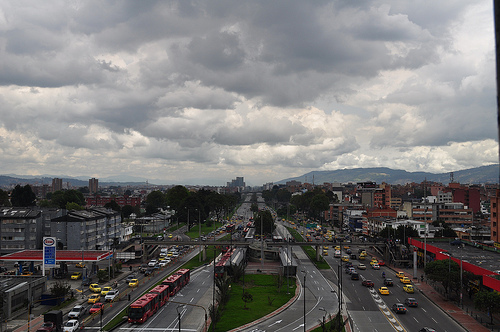 The success of Bogota's TransMilenio bus rapid transit system is largely based on the concentrated development that has occurred around bus corridors. Photo by Javier Guillot. This post is part of a series analyzing the solutions highlighted in the report and toolkit, “Megacities on the Move.” The report, written by London-based Forum for the Future in partnership with FIA Foundation, Vodafone, and EMBARQ, offers six sustainable mobility solutions for massive cities that include examples of solutions currently in practice and those in development. The first of these is “Integrate, Integrate Integrate.” For a summary of the report and more information on the project, check out a previous post on TheCityFix. A truly integrative system of transportation in cities looks first at people and quality of life. In planning for the future, as population grows and environmental issues become more acute, integration is a key means of moving towards sustainability in the world’s largest cities. Specifically, the report states, “transport, urban planning, business, public services, energy and food supply” are sectors that should “no longer be considered in isolation.” Instead these sectors should be considered together to establish integrated systems where people have choice, flexibility and seamless connectivity to provide long-term mobility solutions. “Megacities on the Move” looks at integration by analyzing how urban transportation systems impact and can improve a range of issues from air pollution to congestion to road safety to public health to social justice. Without developing, implementing and operating transport in concert with other sectors, mobility systems will not address the environmental, accessibility and quality of life issues that impact cities. Dario Hidalgo, Senior Transport Engineer at EMBARQ, the producer of this blog, says, “Integration brings big synergies. If a given intervention, such as the introduction of a high capacity bus rapid transit corridor is coupled with provisions for denser land use and disincentives for individual car travel, the impacts are much bigger than such policies or systems in isolation.” For example, “hybrid buses without any priority would reduce emissions, but will not reduce travel time; denser land use and congestion pricing without transit will not be sustainable.” When well-integrated, “transportation can reduce travel time, pollutant emissions, road injuries and deaths, and will increase physical activity, ultimately making cities more livable, economically competitive and fun,” says Hidalgo. There are a myriad of benefits of a well-integrated transportation system. Including other sectors in the planning, implementation and funding process ensures that transit and city services meet a broad range of human and environmental needs. For example, the “avoid-shift-improve” framework for approaching climate change in the transportation sector relies on integrative tactics. Cities can avoid unnecessary vehicle travel through measures like transit-oriented development and telecommuting; shift to more efficient and safer modes, like walking, cycling and mass transit; and finally, improve vehicles, facilities and operations in various ways, such as increasing fuel efficiency or incorporating LEED standards. This process by its very nature involves long-term, integrated solutions and strong partnerships. Transit-oriented development (TOD) incorporates diverse issues and systems into a simple solution. This approach locates people, jobs and services in areas within walking distance – about a half mile – of public transportation. TOD incorporates zoning and planning regulations with transit, concentrating growth near transportation hubs. Good TOD practice includes mixed-income housing in these areas and creates a sense of place through pedestrian and biking infrastructure as well as “traffic calming” measures to control vehicle speeds. Transit planners, government leaders, land use planners, developers, residents and the business community must work together to build an integrated system in order for TOD to be effective. Beyond providing accessibility to transportation and services, TOD can improve road safety by reducing the number of vehicles on the road, encouraging walkers and bikers to use the streets. Fundamentally, the principles of TOD promote integration of housing, employment and services to reduce the need to travel beyond walking distance. Orientation around transit assets then allows the remaining longer trips to occur using personal vehicles. Many transport and urban planning experts have argued for the need to consider suburban retrofitting as a serious future solution to unsustainable urban sprawl. This involves identifying incremental, low-cost changes to the land-use and transportation systems in existing communities to better facilitate transit access, cycling and walking. The system has improved street safety and reduced accidents by 81 percent, improving quality of life in Bogota and enhancing the attractiveness of the city in ways far broader than mobility. For more on TransMilenio, go here. “Megacities on the Move” mentions solar powered electric bicycles that can be stored as seats in buses as an approach to linking multiple modes of transport. When ridden, these bikes store energy; they can be also stored at bus stops to generate energy via solar cells. This approach links bike use and mass transit and could potentially increase usage of both forms of transportation by making the two systems more convenient and reliable for users. Biking and walking allow people to get from one place to another efficiently and cheaply but again, these modes only work when integrated with dense land use. Simple measures such as buses that store bikes, safe bike lanes, bike parking at job sites and along the street can increase the modal share of biking by encouraging new riders and those who do ride to use their bikes more often. New technologies for bike share systems such as mobile phone applications that track bike locations at storage stations and provide information on docking locations provide convenience and reliability. And universal fare card systems like integrated (or smart) fare systems, something India is now looking to as a way to pay for diverse modes of transit in cities will make connectivity among different modes of transit easier and simpler for users. Even though “Megacities on the Move” focuses on design and infrastructure changes that will be needed in thirty years, the concept of walkability and bikability is unlikely to change significantly. Policy and infrastructure that no longer ignore the intersection of land use and transportation planning, improved accessibility for walking and cycling, as well as technologies that better connect riders with public transit all have room to incorporate the possibilities of future transit technologies and information technology.